If you’ve been following my blog for a while, you know we’re big fans of math games around here. If you’re new to my blog, perhaps you’d like to know, well, we’re big fans of math games around here! In fact, Roberto and I used to teach math games classes at both our local co-ops. Needless to say, when we were offered Shape Whiz by SimplyFun, we just had to say yes, please! We received the geometry game Shape Whiz for free from SimplyFun in exchange for my thorough and honest review. Shape Whiz is a geometry game for kids ages 10 and up. It has 2 decks of cards. The whiz cards ask the geometry questions, and include a figure illustrating the point. The shape cards have all the clues to answer them. The shape cards come in two levels of difficulty: the easy (blue shapes), and the medium (green shapes). Each shape card depicts the shape on one side, cleverly designed on top of a blackboard-and-white-chalk type grid. This way, the child may respond just by looking at the drawing. Of course this may happen provided the child knows his geometry, and it’s a blue shape, usually. Answering questions about some of the green shapes require more than just mere observation. That’s when flipping the shape card saves the day. Its reverse side contains all the “shape properties” neatly diagramed and labeled. Thus, even a total geometry newbie can participate, and learn the concepts just by playing along. Quite a thoughtful game, wouldn’t you say? As you can see from the questions, it’s easy for more than one player to spot a card or 2, or 3, matching the given condition. That’s when speed comes into play. The first player who picks the appropriate card and proofs such condition is true, earns that shape card. To make it more interesting, any player can respond to a question using any card on the table that has the answer, regardless of its owner. Once the full deck of questions is depleted, the player who has collected the most shape cards wins the game. What Are Our Thoughts About Shape Whiz? Super Hero and I like Shape Whiz a lot. The game is easy to play, it’s fun and educational! It really delivers an enjoyable, non-threatening way for the child to familiarize himself with basic geometry concepts. Or to strengthen concepts if he’s already familiar with them. It’s also quite flexible. You can begin playing with just the easy, blue shape cards to get acquainted with the game, or with geometry itself. Then you can gradually incorporate some of the green cards as needed. You could also make it longer by using both sides of the whiz cards, (both sides include questions.) We usually have just used one side on one go, that’s been quite appropriate so far. When we play with more players, we might extend the game by doing so. As with everything else, the more the child plays (read practices), the faster he’s able to answer the questions (read master geometry concepts). Super Hero rated Shape Whiz 5 stars on every item, except “Open and Go” which got 4.6. “We do have to set it up” –he reasoned. Well, we do have to shuffle and deal the cards. Actually, I can’t think of a card game where you don’t need to do that. I wouldn’t call it a “set-up”, but strictly speaking, it isn’t “Open and Go” in his opinion. It is in mine, I do totally give Shape Whiz 5 stars all around! It’s fun. The game is good, you have to be fast at it, and I like it. I like it, too! And I highly recommend this fun game as an addition to your math studies. There’s no way not to learn something after playing this game, and enjoying it all along! If you’d like to spice up your geometry lessons, you might want to give this game a try. 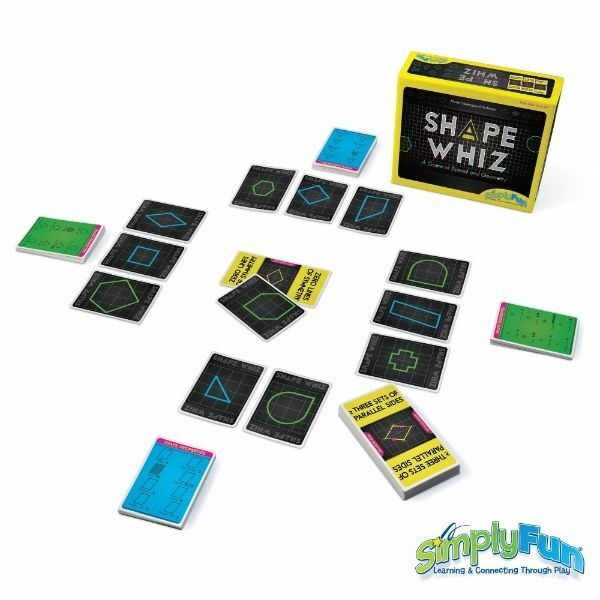 Check out SimplyFun, where you can buy Shape Whiz for $24. Oh and by the way, Super Hero is not yet 10. So the target audience may include kids younger than 10, especially if they have an aptitude for mathematics.